Small-angle x-ray scattering (SAXS) is a well-established technique for studying structural features of colloidal size (1-100 nm). When x-rays are transmitted through a sample, the interaction of radiation with matter results, among others, in scattering events. The waves scattered by all electrons in the sample at a given angle interfere with each other to produce a point in an interference pattern. Appropriate analysis of SAXS data supplies wealth of structural information, such as size, shape, internal structure and mass of particles, particle size distribution in polydispersed systems, and fractal dimensions in disordered systems. 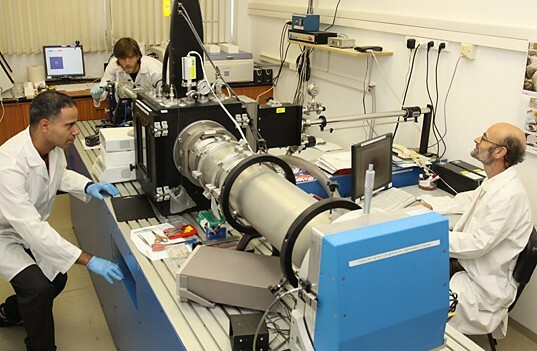 The small-angle X-ray scattering facility at the Technion has been set up in 1988. It has been used continuously by researchers, graduate and undergraduate students of our department as well as from other Departments in Israel, U.S., Europe and Japan. Several Israeli Industries have had projects in association with our facility. The breadth of the field, which can be approached by this technique, is demonstrated by some of our research topics. One major area of interest is polymer solutions and gels. We have studied inhomogeneities in polymer gels, inter-polymer complexes and thermo-reversible gelation on polymer solutions. We are investigating various Colloids and surfactants systems, for example the effect of interaction with polymers on the size and shape of surfactant micelles in water, evaluation of micellar dimensions of novel surfactants, and the inner structure of multicomponent polymeric latices as a function of composition and method of preparation. In the area of Ceramics and Inorganic Solids we explored the relation between processing parameters and the evolution of microstructure in novel procedures for preparation of alumina gels. We have studied the effect of ion-irradiation on amorphous SiO2 as a model for the ageing of glassy materials used in nuclear waste disposal, and the structure of zeolite precursors. Evaluation of the microstructure in Solid Polymer Blends, Fibers and Composites is another important aspect of our work. We are determining the microstructure of semi-crystalline polymer fibers under the combined effect of stress, temperature and solvent activity, the effect of reactive compatibilizers on the interface characteristics in polypropylene/liquid-crystal polymer blends and characterizing the size and amount of voids in fiber-reinforced composite materials.